I wanna say the first thing I really saw that was Stephen King produced was “Creepshow” or maybe “Cujo ”. I don’t know, it was so long ago its now lost to relative antiquity. What I do remember is that I was both intrigued and freaked out at both and every subsequent viewing of any of his inspired movies. And to be honest, I haven’t read any of his books because I don’t think I could handle the extra detail. In any case it goes without saying that the guy is a genius and has a formula that works well. I think that’s a good thing because it allows him to take his inspiration and produce material at a lightning fast rate. This formula is no different for “1922“ which I happened to catch on Netflix recently. 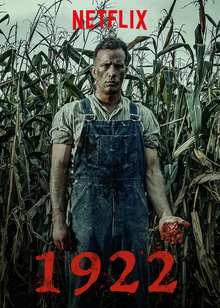 The movie stars Thomas Jane and Molly Parker who play a married couple that are essentially farmers in the year 1922. The story begins with farmer Wilfred James confessing to the murder of his wife which he is seen furiously scribing in a letter recalling the events leading up to and ensuing after committing the crime. I think it’s always a challenge for a story such as this to give you the punch line up front then have to explain what happens leading up to it. But, King’s stories are usually descriptive enough to avoid the cop out of a twist and “1922” handles this very well. As mentioned, Stephen King has a definite and recognizable style that can make for a consistently enjoyable viewing. One of the things I like about his stories is that they can contain a spiritual element, a psychological element or both mixed in with a rich human experience. This film offers all of these elements. You get the feeling the whole time that Wilfred is a man determined to live his dream and has the vehicle to do so but is met with opposition from his wife who has other plans. Because he is so determined, it undermines his moral standing and he’s determined enough to do what it takes to keep it all even if that means killing his wife to do it. You’re drawn into each of the characters immediately as a result of this conflict. You definitely feel for each of the characters when said and done, but you also get a sense that they probably deserved what they got. Who’s that looking over his shoulder…? There’s really a couple of complaints that I really consider minor but nevertheless were present. The first thing was that it was a pretty slow watch. What I mean is the pacing seemed off at times and certain scenes could’ve been sped up to make it feel more cohesive. I think along with this is that there seemed to be certain scenes that could’ve been left out because they were redundant and often repeats of something that was already understood. The second thing I felt was that it oddly seemed to wrap up quickly despite the slower pace. Maybe this could’ve been spread out to give it more of that even pace I spoke of. Like I said, not a deal breaker. It’s for anyone who’s a Stephen King fan or who simply loves a good ole fashioned creepy psychological thriller with a nip of paranormal mayhem. It’s certainly for those who like a good story. Warning, definitely not for kids. Let me know if you seen it and what you think below.